mnbutch101 has no other items for sale. 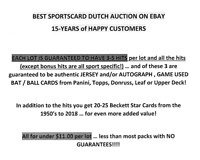 (20) Baseball Card Lot! G/U Jersey, AUTO, SP #, RC, Refractor, Mike Trout! (14) - MIKE TROUT ANAHEIM ANGELS 2010 CEDAR RAPIDS KERNELS ROOKIE CARD LOT! $0.00 shipping for each additional eligible item you buy from mnbutch101. paypal is welcome for all auctions......additional listings purchased can be sent at no additional shipping charge ...U S ONLY ..